Самораспространяющийся высокотемпературный синтез (СВС) является новым методом получения нового класса катализаторов различного применения на основе металлов, сплавов, оксидов, шпинелей и т.д. СВС представляет собой режим протекания сильной экзотермической реакции (реакции горения), в котором тепловыделение локализовано в слое и передается от слоя к слою путем теплопередачи. В условиях быстрых скоростей реакций горения и охлаждения образуются структуры с высокой концентрацией дефектов промежуточных и нестехиометрических соединений, которые являются одной из причин высокой активности СВС катализаторов. Проведены исследования физико-химических и механических свойств широкого спектра синтезированных СВС катализаторов. В результате этих исследований учеными различных стран мира найдены СВС материалы, обладающие высокой каталитической активностью, перспективные для многих промышленных процессов. В этом обзоре описывается СВС метод, его преимущества, как метода приготовления высокоактивных катализаторов для процессов нейтрализации выхлопных газов, дегидродимеризации метана, пиролиза, гидрирования и др. Металлдар, құймалар, оксидтер, шпинельдер және т.б. әртүрлі қолданыс негізіндегі жаңа класты катализаторлар алудың жаңа әдісі жоғары температуралы өздігімен таралатын синтез деп аталады (ЖТӨТС). ЖТӨТС қатты экзотермиялық реакцияның өту режимі (жану реакциясы) онда жылу бөлінуі қабатта шоғырланып қабаттан қабатқа жылу берілуі арқылы жүреді. ЖТӨТС катализаторларының белсенділігінің бірден бір себебі тез жылдамдықтың негізінде жүретін жану және суыту реакцияларында дефекттердің жоғары концентрациясымен аралық және стехиометриясыз құрылымдар түзетін қосылыстардың түзілуімен байланысты болады. Кең көлемде синтезделіп алынған ЖТӨТС катализаторларының фиизко-химиялық және механикалық қасиеттерін зерттеу жүргізілді. Әлемнің әр түрлі елдеріндегі ғалымдардың зерттеулерінің нәтижесінде көптеген өндірістік процестердің болашағы бар жоғары каталитикалық белсенділігіне ие ЖТӨСТ материалдары табылды. Бұл шолуда ЖТӨСТ әдісі, әсіресе жоғары белсенді катализаторларын өндірістік газдарды, метанның дегидродимеризациясы, пиролиз, гидрлеу және т.б. процестерде бейтараптау үшін қолданылатын катализаторларды дайындаудың әдістері және оның қолайлы жақтары көрсетілген. The Self-Propagating High-Temperature Synthesis (SHS) method is being developed for the production of a new class of active catalyst materials based on metals, alloys, metal oxides and spinels for various applications. The conditions of quick velocities of combustion and cooling processes helps of catalytic active structures synthesis, due to formation of high concentration of defect structures of intermediate and non-stoichiometric compounds. A large range of materials have been produced and characterized by a variety of physico-chemical and mechanical tests. A number of catalytically active SHS materials all over the world have been identified which offer promise for applications in huge range of processes. This report reviews briefly the SHS method, its advantages and discusses a number of its applications such as highly active catalysts for exhaust emission control, methane conversion, dehydrodimerization, pyrolysis and many others processes. Keywords: Self-propagating high-temperature synthesis, SHS catalysts and carriers, catalytic properties, solution combustion synthesis. SHS is relatively new method of the catalysts and carriers synthesis. SHS method is being developed worldwide [1-2] for the low-cost production of engineering and functional materials such as advanced ceramics, intermetallics, catalysts and magnetic materials. The method exploits self-sustaining solid-flame combustion reactions for the internal development of very high temperatures over very short periods. It therefore offers many advantages over traditional methods such as much lower energy costs, ease of manufacture and capability for producing materials with unique properties and characteristics. SHS method was first invented in 1967  in the ex Soviet Union but only became known worldwide in the beginning of the 80’s.Using SHS, composition, structure and properties of the materials can be regulated to satisfy the stringent requirements of many applications. SHS can start without initiation at preheating temperature when chemical reactions start. At room temperature initiation can be by electrically heated element. Once initiated, combustion is self-sustaining and proceeds by a combustion wave propagating through the compacted material from the initiation side to the opposite side and is completed in a time of a few seconds to a few minutes. The material in front of the propagating wave is preheated by the heat generated by the combustion and the material behind the combustion front is rapidly cooled. A schematic diagram of the SHS process is shown in Figure 1. The basic principles of SHS can thus be summarized as follows [2,3]: Rapid auto wave combustion-like self-sustaining reactions yielding resultant products of desired composition and structure, complete or partial elimination of external energy supply by the utilization of the internal heat released in the chemical reactions, control of the process rate, temperature, degree of conversion and composition and structure of products by variation in the rates of heat release and transfer. In many cases SHS offers greater benefits in comparison with traditional methods especially as regards lower production costs and manufacturing advantages [2,4] but also in terms of microstructure and superior properties. In addition, the environmental impact of SHS is very much lower than that of the traditional method, a fact which decreases even further the indirect cost of production [2-3]. As a result, SHS has now become an extensively studied discipline and is often regarded as a link between combustion theory and materials science. The first large scale and systematic research of SHS catalysts start in the 80s in Combustion problem Institute, Almaty, Kazakhstan. It was found, that method offers a good possibility for the preparation of new, active ceramic catalysts and carriers with compositions, structure and properties which satisfy the stringent requirements of many applications [3-5]. The interest to SHS catalysts is growing every year and now many countries intensively working with SHS and combustion synthesis catalysts: Russia, USA, Kazakhstan, Japan, Armenia, Greece, Brazil, Spain, Portugal, Armenia, Korea, India, China, Puerto Rico, Malaysia, etc. Such interest to SHS catalyst can be explained by high activity of catalysts prepared by this methods and advantages of SHS method in comparison with traditional methods of preparation of catalysts. The main differences of SHS method in comparison with other methods of preparation of catalysts are: highly exothermic reaction of a mixture of powders, low pre-heating temperature but very high reaction (combustion) temperatures 1000 - 3000oC, very high heating and cooling rates: 103 - 106 oC/sec, very short completion times, of the order of minutes. Method is attractive for industrial production: much lower energy consumption than traditional production methods, much lower energy costs, possibility for “just-in-time” manufacturing, high productivity, cheap catalysts, relatively simple process - easily adaptable to industrial scale, controlled physico-chemical properties of the products, large range of new materials which can be used in catalysis, it has wide diapason of structural forms of products - from granules of different size to blocks of honeycomb structure and different geometric forms. Various compositions and reaction conditions have yielded promising catalysts for many processes. Many of the new materials can only be produced by SHS. New active catalysts were found for: oxidation of CO, methane and hydrocarbons, dehydrogenation of hydrocarbons, hydrogenation of unsaturated hydrocarbons, oxidative dehydrodimerization of methane, pyrolysis of petrol, diesel, naphtha, other fuels; ammonia synthesis and other processes. In the [3-5] for the first time is developed general conception SHS catalysts production with high mechanical properties, were found and developed optimal conditions of SH synthesis, studied genesis of phase composition, structure-mechanical, catalytic properties of SHS catalysts and carriers on the base of metals, oxides, spinels, intermetallic compounds of I-VIII groups of periodic system. It was found that prepared SHS materials are new class of catalysts and carriers, which is not possible to produce by traditional methods of chemical technology. Possibilities of new method were demonstrated. In [4-8] for the first time was studied mechanism of catalysts and carriers formation in the combustion wave (Figure 2), were discovered main stages of process (Table 1), including: preheating, melting and splitting of liquid phase, first structure formation with oxidizing-reducing reactions, secondary structure formation in the process of further reaction of components, final structure formation in the process of cooling (Table 1). The conditions under which many SHS ceramic catalysts are cooled after combustion were found to significantly influence their composition, structure, properties and catalytic activity (Table 2) . During self-sustaining exothermic combustion of carefully designed and controlled mixtures of powders, the synthesis temperature can reach 1000-3000 oC over a very short total time of reaction: of the order of a few seconds. Under these conditions, the materials synthesized are characterized by a very high content of crystal lattice defects which is very significant as far as catalytic properties are concerned, as they act as active centers for catalysis. Following the passage of the combustion wave, the material behind the wave front starts cooling - the final structure and composition depends on the rate and nature of cooling. 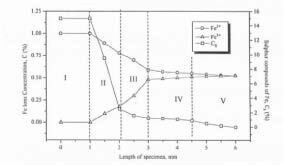 Figure 1 shows a concentration profile of the wave of combustion under SHS conditions for an iron containing system , (initial SHS charge contained powders of Al, Mg, Mg(NO3)2, FeSO4). Five zones of structural and chemical conversion can be distinguished whose characteristics are tabulated in Table 1. Zone V is the cooling zone and it is obvious that the composition of the materials is still changing. By cooling the specimen under various rates and conditions (from a few hundreds to hundreds of thousands of degrees per minute), it is thus possible to obtain a range of compositions and also change the lattice defect concentration. It was found, [3-8] that the main parameters of SH synthesis process of catalysts and carriers is maximum temperature in the synthesis wave, which depends from batch composition, dispersity of reducer and oxidizer (less but also from dispersity of other components) and preheating temperature, that the most important from technological parameters of SHS catalysts and carriers are chemical composition and initial batch components dispersity, conditions of granulation and mixing of components, chemical composition of additives, conditions of shaping, conditions of preheating, initiation of SHS process, regime of cooling (Figure 3). It was found  that main parameters of regulated porosity formation in the SHS regime are maximum synthesis temperature and presence in the initial batch organic and inorganic substances easy gasified and burning out. SHS technology permits regulation of final catalyst porosity from 20 to 98% with required mechanical properties. One of the most important parameters is cooling conditions. The material based on the Al-Co-O was subjected to SHS combustion under identical conditions and then cooled at different conditions: in the furnace, in air (at room temperature), in brine (salt and water solution) and in liquid nitrogen (Table 2). The cooling rate mostly affects catalysts, because changing of composition and structure lead to changing of activity. At faster rates of cooling, more structural defects of the crystal lattice are generated (defects are the active centers of catalysts), increasing the material’s activity. But the final activity of the catalyst depends on both parameters: defect structure and composition. For example in the case of dehydrogenation, most important is the quantity of cobalt in the catalyst. In the case of the Al-Co-O system, the most active catalyst was found to be the one containing 28% Co (cooling in brine), the yield of hydrogen in this case being 90% (Table 2). For the first time [3-5] were studied influences of different factors on the SHS catalysts surface area. It can be regulated from 5 to 20 m2/g during synthesis. Main reason of such low surface area is high temperatures during combustion; pore size is 500-10000Å (Figure 4). Further increasing of surface area up to 100-200m2/g can be only by additional treatment: impregnation, leaching, formation of honeycomb structure. It was offered [3-5] in principle new, very effective method of SHS catalysts and carriers synthesis. Developed scientific base of technology could be used for developing technology for industrial catalysts and carrier’s production. One of the new directions following SHS method is Solution combustion (SC) synthesis , which is also very prospective for synthesis of catalysts, because it permits to produce catalysts with high surface area. Solution combustion (SC) synthesis, takes place in an aqueous solution of the oxidizers (e.g. metals nitrites) and fuels (e.g. glycine, citric acid and urea). In conventional scheme, at certain temperature (100–200oC) the reaction self-ignites through the entire reactive media (so-called volume combustion synthesis (VCS) mode) leading to the formation of fine solid products with tailored composition. Under equilibrium conditions, in general such combustion reactions can be represented as follows: modifications of the solution Mex(NO3)y + CH2NH2CO2H9 +O2 => MeO + CO2 +H2O + N2. Recently by prof. Mukasyan with collaborators from USA were developed modifications of the solution combustion synthesis. These methods include . 1. Self-propagating sol–gel combustion (SSGC): the desired amount of metals nitrates + fuel solution is dried at room temperature to make a sol–gel like heterogeneous media, which was than locally ignited with the help of heated tungsten wire. As a result a self-sustained reaction wave steadily propagates along the media forming nano-powder of desired composition. This steady-state propagating mode allows more precise control of the material composition and structure as compared to conventional VCS scheme, which proceeds by thermal explosion. 2. Impregnated support combustion (ISC) method involves impregnation of reaction solution inside the porous structure of the inert solid support, followed by reaction initiation similar to those in SSGC mode. ISC permits synthesize of supported catalyst with extremely high surface areas (up to 200m2 g−1). 3. Impregnated active layers combustion (IALC) method. In this case, the reaction solution is impregnated, for example, into thin, pure cellulose paper and dried at room temperature. Further, such paper is locally ignited at room temperature and steady-state combustion front propagates along the reactive media. The maximum reaction temperature can be as high as 1000 oC, but reaction time owing to the rapid quenching of thin reacted layer, is less than 0.1 s. By this method also can be produced catalysts with surface area. Note, that amount of residual carbon in as-prepared materials by IALC approach does not exceed 0.1 wt.%. Another direction of SHS synthesis of catalysts is synthesis by reactive milling. Synthesis of WC catalysts by reactive milling, followed by Self-sustaining reaction for hydrogenation, methanation and ammonium synthesis was presented in work of prof. K.S. Martirosyan with collaborators from USA . Also scientists from Brasil study reactive milling – SHS process for synthesis of catalysts on the base of WC, in the initial batch they take WO3, Mg, C .
Mechanical activation of Self-Propagating High-Temperature-Synthesized LaFeO3 to be used as catalyst for diesel soot oxidation was studied by prof. T. Akiyama with collaborators from Japan . SHS catalysts and catalysts prepared by solution combustion synthesis were studied in number of different processes. Oxide catalysts prepared using the self-propagating high-temperature synthesis (SHS) method were found to display high activity for oxidation of CO. Catalytic oxidation of carbon monoxide and propane on SHS sialon impregnated by oxides was studied in ISMAN (Russia) . SHS-produced β-sialons Si6−z Alz Oz N8−z (z = 1, 3, 4) were tested as supports for oxidation catalysts comprising of unary, binary or ternary mixtures of transition metal (Cr, Mn, Fe, Co, Ni, Cu) oxides and also KMnO4 and K2Cr2O7.Oxides of transition metals(Cr, Mn, Fe, Co, Ni, Cu) were deposited onto sialon granules by cold impregnation.. In oxidation of CO and propane (C3H8), the highest activity was exhibited by the catalysts based on cobalt oxides (Figure 5): 100% conversion at 180oC. The performance of the best Co-containing catalysts immobilized on the β-sialon with z = 1 was found to be close to that of the commercially available Pt-containing catalyst. Due to their high heat resistance and thermal stability, β-sialons can withstand high temperatures and operate in strongly abrasive and acidic media, and thus challenge such widely used catalyst carriers as alumina and aluminosilicates. Comparison between SHS catalysts of the system Cu-Cr-O and commercial catalyst systems for carbon monoxide oxidation in exhaust gases of internal combustion engines were studied in Greece . The results show that CuCr2O4 catalyst prepared by SHS used as crushed materials without carrier or additional treatment display equivalent activity to that displayed by conventional 0.5%Pd/Al2O3 system even though its specific area was only about 1m2/g as compared to about 90% for traditional Pd/Al2O3 catalysts with much higher specific area. Similar catalyst: Cu1-xNixCr2O4 produced by combustion synthesis for CO oxidation by Scientists from Brazil . The surface self-propagating thermal synthesis (SSTS) of supported oxide catalysts was used by Russian group to produce supported oxide catalysts for deep oxidation of CO and methane . Pd–CeO2 catalysts on a monolith support with a honeycomb structure have been prepared by surface self-propagating thermal synthesis (SSTS) . The Pd–CeO2/Al2O3 monoliths prepared by SSTS are more active in CO oxidation, total hydrocarbon oxidation, and nitrogen oxide reduction than the catalysts obtained by conventional impregnation. This is explained by the fact that the SSTS products have a larger specific surface area and their active component has a smaller particle size. catalysts without any methanation . The self-propagating high-temperature synthesis method has been used to produce a range of oxide catalysts which have been found to be active for deep oxidation of methane /20/. The SHS materials studied include various compositions based on the systems K-Mn-Al-O, Al–Mn–Mg–O, Mg–Cr–O, Mg–Al–O, Mg–Cr–Al–O and Cu–Cr–O with and without the addition of Cerium oxide and an epoxide additive. Specific compositions of these systems were identified as being significantly active for this process (maximum conversion of up to 76%) and were thus investigated further. Many of the systems can be easily formed by extrusion and SHS into catalytically active, mechanically strong, honeycomb block structures in one step. Coating these active blocks with a known catalyst (known to be active in this process), was found to enhance the overall catalytic activity giving maximum conversion of up to 100% and offers an inexpensive and viable alternative to traditional catalyst systems. 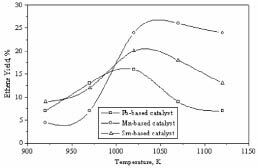 Supported Pd catalyst for high-temperature methane combustion was studied /21/ by examining the combustion synthesis preparation method. The major drawback of the SHS is that it leads to low surface area materials. The addition of low contents of lanthanides, especially cerium, showed to be effective to enhance the oxides texture. It was also seen that low loading of CeO2 well dispersed on alumina works as catalyst promoter on methane combustion. The same authors from Brazil  evaluated combustion synthesis as a preparation method of perovskites with cerium for methane oxidation. It was reported, that all perovskites catalysts which they study showed to be active in methane combustion. The results indicated that over the perovskites loaded with cerium the oxygen adsorbed onto the catalyst surface plays significant role in the activity of the catalysts. Catalytic properties SHS borides and complex oxides were studied in methane oxidative dehydrodimerization, the yield of ethene is 7.2-16.8% [23-24]. Very active manganese, samarium and lead spinels based SHS catalysts (Figure 6) were found for oxidative dehydrodimerization of methane in other work [25-26], the maximum yield of ethene is 26%. The first work on SHS catalysts soot oxidation published in 1995 . Activity of various SHS powder and block catalysts was studied in process of burning out soot for the purifying of outgoing gases of diesel motor. Best results show Cu-Al-Mg-O SHS catalysts (soot burning out temperature is 420oC). Scientists from USA  study temperature programmed combustion of the catalytic carbon combustion over SHS CeCrO3 and La0.8Cr0.9Li0.1O3 catalysts micro- and nanostructured complex oxides powder. Carbon burned out temperature was 400oC for CeCrO3 and 500oC for La0.8Cr0.9Li0.1O3. Authors from Hokkaido University, Japan [28-29] study Self-Propagating High-Temperature Synthesis with post-heat treatment of La1−xSrxFeO3 (x = 0–1) perovskite as catalyst for soot combustion. La1−xSrxFeO3 perovskite, Sr-substituted LaFeO3, was prepared by Self-Propagating High-Temperature Synthesis and its catalytic activity for soot combustion was experimentally examined in comparison with that of a conventional Pt/Al2O3 catalyst. The soot combustion temperature of this product is as much as 1000 C lower than that of non-catalytic soot combustion. In other words, it had the same activity as that at only 200 C higher, in comparison to conventional Pt/Al2O3 catalyst. More significantly, average apparent activation energy of sample with x = 0.8 calculated by Friedman method using TG/DTA was approximately 15 kJ/mol lower than that of Pt/Al2O3 catalyst. This result suggested that La1−xSrxFeO3 has the possibility to be an alternative catalyst to Pt/Al2O3 catalyst. The group of prof. Akiyama studied also mechanical activation of self-propagating high-temperature synthesized LaFeO3 to be used as catalyst for diesel soot oxidation . Proposed active catalyst of SHS LaFeO3 (LFO) as alternatives to precious metals such as platinum for promoting the oxidation of diesel particulate matter. Significantly, the LFO samples exhibited better catalytic activity for the oxidation of carbon black, though their surface area was smaller than that of Pt/Al2O3 (on LFO oxidation of the soot at 400oC, on Pt/Al2O3 485oC). 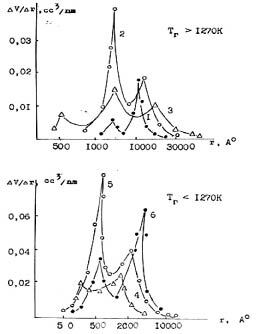 In 1978 Russian scientists  show that titanium, niobium, molybdenum borides obtained by SHS method are active in the process of joint oxidation of nonene-1 and benzaldehyde. In 1981 they  show that molybdenum, cobalt borides obtained by SHS method were also very active (at temperatures 135-150oC) in the process of oxidation of isobutene. Oxidation of styrene oxide and benzaldehyde were studied in 1984  on SHS TiC catalysts. It was found, that transitional metal carbides are catalytically active in oxidation and reduction processes, in photo-and electrocatalysis WC, W2C, Mo2C, TiC, TaC widely used catalysts. Sm(NO3)3. 6H2O, Co(NO3)3 6H2O, Sr(NO3)3 6H2O, Pt (II) acetyl acetonate and urea (CO(NH2)2 as fuel => Sm0.95CoO3-δ, (Sm0.95Co3-δ)0.4Pt, Sm0.7Sr0.3CoO3-δ. The undoped sample (Sm0.95CoO3-δ) exhibits a methanol conversion of about 45%. The Pt impregnated samples, which have a ratio of Pt/Sm surface = 2, exhibit the best catalytic activity, methanol conversion is 63%. 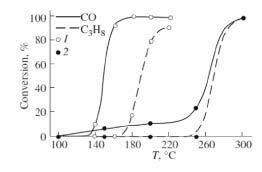 Hydrogen oxidation on titanium carbides prepared by SHS was studied by Armenian scientists  It is shown that catalytic activity of Ti carbides grows with increase in carbon deficiency in a carbide sublattice in a TiC0.6 > TiC0.8 > TiC row. Spanish scientists  found active Pt–Ru–Ni anode electrocatalyst prepared by combustion synthesis (employing two different fuels), that is, urea and sucrose for proton exchange membrane fuel cell (PEMFC).The results obtained reveal combustion synthesis as an appropriate method for preparing PEMFC electrocatalysts, due to its versatility, simplicity and fastness. 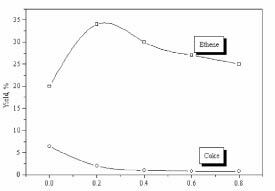 Catalytic pyrolysis of diesel fuel on SHS catalysts made of cobalt-doped Mg-Al-O spinels offer high yield of ethylene while coke yield is drastically reduced, in comparison with other catalytic systems and thermal pyrolysis (Figure 7) . Catalytic pyrolysis of naphtha on SHS catalysts on complex oxide catalysts also is successful: the yield of ethane and propene is 51%. Solution combustion catalysts LaFe0.6Ni0.4O3/Al2O3 is characterized by high stability and activity for steam reforming of JP-8 surrogate (kerosene–based jet propulsion fuel) . Full conversion was maintained during the duration of experiments (12 h) and hydrogen concentration is close to predicted theoretical limit (42%). Perovskite catalysts for the auto-reforming of sulfur containing fuels prepared by Solution combustion show good results . Nickel-skeleton SHS catalysts and Ni-based catalysts show very high activity in process of hydrogenation of compounds with double and triple unsaturated bonds. 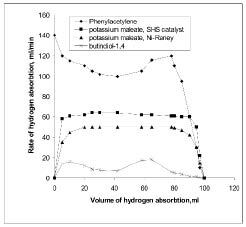 For example Ni-SHS skeleton catalysts in potassium maleate hydrogenation at 40oC have 20% higher velocity of hydrogenation than industrial Ni-Raney catalyst [3-4] (Figure 8). Skeleton SHS catalysts were studied also in process of hexene-1 hydrogenation . The efficiency of the skeleton nickel catalysts, prepared by leaching SHS aluminides, has been found to be well above for olefins hydrogenation than that of common NiR catalysts. I It was found that for ammonia synthesis  activity of SHS catalysts are compatible with that of an industrial catalyst. SHS catalysts (NixZn1-x)Fe2O4 and (MnxZn1-x)Fe2O4 (monolithic reactors ) were active in solar water splitting for hydrogen production . The synthesized SHS catalyst systems are able to split water and generate hydrogen as the only product, at temperatures as low as 800oC with conversions reaching 80% in terms of water. Multi-component catalysts containing copper, zinc, zirconium, and palladium were prepared by a combustion synthesis method referred as impregnated layer combustion synthesis (ILCS) . These catalysts were active and selective for the production of hydrogen by the oxidative reforming of methanol. ILCS involves impregnation of a reactive solution containing nitrated of the catalytic components and glycine which is impregnated into a cellulose substrate. The exothermic combustion of the mixture to form oxides led to the formation of a self-propagating combustion. It is shown that synthesis procedures and the presence of a ZrO2 support have a significant effect on Pd dispersion and on the resulting catalytic activity and selectivity. Catalyst with 3%Pd loaded in a second wave impregnation (SWI) method showed exceptional high activity for methanol conversion at low temperatures, whereas the ZrO2 supported catalyst displayed superior selectivity toward hydrogen production over the whole range of the temperatures investigated. Technology of catalysts production (metals/oxides, oxides, borides, carbides, nitrides, oxinitrides, alloys, etc.) and carriers by SHS and combustion synthesis is an advanced stage. There is possibility for “just in time” manufacturing of the SHS catalysts, which has low production costs and good competitiveness. New SHS catalysts for internal combustion engines offer higher activities for CO oxidation than commercial systems using Pd or Pt on Al2O3 or cordierite carriers, even at very low specific areas (about 1m2/g), often as low as 1% of those of noble-metal systems. Some of the new catalysts have potential for replacement of noble metal or other industrial catalysts. For example, catalysts Cu1-xNixCr2O4, Cu-Cr-O, Co-Cr-Al-O active at 160oC, supported oxide (Co3O4, CuO, Mn3O4) and spinel (CoMnOx, CuCoyOx) catalysts on SHS carriers β-sialons Si6–zAlzOzN8–z (z = 1, 3, 4) etc. Very active SHS catalysts were found for methane oxidation (K-Mn-Al-O, perovskites), oxidative conversion of methane (SHS spinel catalysts Fe-Al-O, Ni-Al-O, Ni-Fe-Al-O, Sn-Al-Mg-O, Co-Al-O), joint oxidation of nonene-1, benzaldehyde and isobutene (TiB2, NbB2, CoB, MoB, MoB2, MoS2), oxidation and reduction processes, in photo and electrocatalysis (carbides WC, W2C, Mo2C, TiC, TaC), hydrocarbon partial oxidation (SmCoO3-δ prepared by combustion synthesis), dehydrodimerization of methane (LaCaB6-MgO, LaxMeCuzOy, Pb-Mg-O, K-Mn-O, Sm-Al-O, complex oxides Y-Ba-Cu-O), pyrolysis of diesel fuel, petrol, naphtha (CoAl2O4, MgAl2O4,CoAl2O4), steam reforming of JP-8 surrogate (LaFeO3-based perovskite (La0.6Ce0.4Fe0.8−ZNi0.2O3−δ)), combustion of soot (Cu-Al-Mg-O, LaFeO3, La1−xSrxFeO3, CeCrO3, La0.8Cr0.9Li0.1O3), hydrogenation (NiAl2O4, NixAly skeleton catalysts), ammonia synthesis (FexAly ), etc. Carriers prepared by SHS method are already produced industrially. New SHS catalysts for pyrolysis of hydrocarbons offer high industrial potential as their high activity is accompanied by reduced coke production. SHS catalysts have industrial application, they are used for pyrolysis of naphtha. Very active catalysts were found for CH4, hydrocarbons oxidation, for dehydrodimerization of methane and others. The high catalytic activity at such low specific areas is related to both the SHS materials’ unique composition as well as their very high atomic defect concentration resulting from the SHS process conditions. Solution combustion synthesis is very prospective because of possibility of organizing high surface area. SHS and solution combustion synthesis can be considered as very successful method of synthesis of new cheap and very active catalysts and catalysts on carriers. 1. Merzhanov A.G., Combustion and Plasma Synthesis of High Temperature Materials, VCH Publishers, NY, 1990. 2. Merzhanov A.G., Int. J. of Self-Propagating High-Temperature Synthesis, 1997. V. 6. P.119. 3. Gladoun (Xanthopoulou) G., Self-propagating High-Temperature Synthesis of Catalysts and Supports, Kazakh Institute of Scientific and Technical Information, Kazakhstan, 1990. 4. Gladoun (Xanthopoulou) G., Self-Propagating High-Temperature Synthesis of Catalysts and Carriers, DSc Dissertation, Moscow, 1991. 5. Gladoun (Xanthopoulou) G., Int. J. of Self-propagation High-Temperature Synthesis, 1994. V.3. P.51. 6. Sergienko V. and Gladoun G., Proc. of 1st Int. Symposium on Self-Propagation High-temperature Synthesis, Moscow, 1991. P.110. 7. Gladoun (Xanthopoulou) G., Sergienko V. and Ksandopulo G.I., Int. J. of Self-Propagating High-Temperature Synthesis, 1997. V. 6. P.399. 8. Xanthopoulou G. and Vekinis G., International Journal of Self-Propagating High Temperature Synthesis, 1999. V.8. P.287. 9. Dinka P., Mukasyan A.S., Journal of Power Sources, 2007. V.167. P. 472. 10. Mukasyan A. S. and Dinka P., International Journal of Self-Propagating High-Temperature Synthesis, 2007. V.16. P. 23. 11. Martirosyan K.S., Litvinov D. and Luss D., Combustion of Heterogeneous Systems: Fundamentals and Applications for Materials Synthesis, 2007. P.67-101. 12. Passadora F.R., Maestrellia S.C., Palloneb R.F., Tomasia R., Materials Science Forum, 2005. V.498-499, P.648. 13. Taniguchi K., Hirano T., Tosho T., Akiyama T.,Catal Lett, 2009. V.130. P.362. 14. Borshch V.N., Zhuk S.Ya., Vakin N.A., Smirnov K.L., Borovinskaya I.P.and Merzhanov A.G., International Journal of Self-Propagating High-Temperature Synthesis, 2009. V.18, P.38. 15. Xanthopoulou G. and Vekinis G.: Applied Catalysis B: Environmental, 1998. V.19, P.37. 16. Pimentel P.M., Ginani M.F., Martinelli A. E., Melo D.M., Pedrosa A.M., Melo M.A., Material Science Forum, 2005. V.498-499. P.663. 17. Zav’yalova U.F., Tret’yakov V.F., Burdeinaya T.N., Lunin V.V., Shitova N.B., Ryzhova N.D., Shmakov A.N., Nizovskii A.I., and Tsyrul’nikov P.G., Kinetics and Catalysis, 2005. V.46. P.752. 18. Zav’yalova U.F., Barbashova P.S., Lermontov A.S., Shitova N.B., Tret’yakov V.F., Burdeinaya T.N., Lunin V.V., Drozdov V.A., Yashnik S.A., Ismagilov Z.R., Tsyrul’nikov P.G., Kinetics and Catalysis, 2007. V.48. P.162. 19. Beraa P., Malwadkarb S., Gayena A., Satyanarayanab C.V., Raob B.S., and Hegdea M.S., Catalysis Letters, 2004. V.96. P.3. 20. Xanthopoulou G. and Vekinis G, Applied Catalysis A: General, 2000. V.199. P.227. 21. Fraga M.A., Greca M.C. and Appel L.G., Utilization of Greenhouse Gases, 2003. V.852. P.375. 22. Fraga M.A., Pereira R.A. and Greca M.C., Materials Science Forum, 2006. V.530-531. P.696. 23. Merzhanov A.G.,et al., RU Patent, No.2000137, No.1806125,1991, Merzhanov A.G., et al., SU Patent, No.1685904, No. 1766498,1991. 24. Gladun G.G., Orinbekova Zh.G., Ksandopulo G.G., Grigoryan E.H., Merzhanov A.G., Borovinskaya I.P. and Nersesyan M.D., USSR Patent No.1729028, 1991. 25. Xanthopoulou G., Applied Catalysis A: General, Letters, 1999. V.185. P.185. 26. Xanthopoulou G., Chemical Engineering and Technology, 2001. V.24. P.1025. 27. Rodivilov S., Gostev S. and Gladoun G. (Xanthopoulou), Proc. of International Seminar Block Supports and Catalysts of Honey-Comb Structure, Sankt-Petersburg, Russia, 1995. P.65. 28. Martirosyan K.S., Litvinov D. and Luss D., Combustion of Heterogeneous Systems: Fundamentals and Application for Materials Synthesis, 2007. P.67. 29. Hirano T., Tosho T., Watanabe T. and Akiyama T., Journal of Alloys and Compounds, 2009. V.470. P.245. 30. Taniguchi K., Hirano T., Tosho T., Akiyama T., Catal Lett., 2009. V.130. P.362. 31. Tavadyan L.A., Maslov S.A.and Blumberg E.A., Neftekhimia, 1978. V.18. P.667. 32. Khirnova G.N., Bulygin M.G. and Blumberg E.A., Neftekhimia,1981. V.21, P.250. 33. Blumberg E.A. and Novikov Yu.D., Review of Sci. and Tech, Kinetica i Kataliz, 1984. V.25. P.269. 34. Chinarro E., Jurado J., Key Engineering Materials, 2002. V.206-213. P.1227. 35. Oganesyan T.K., Gukasyan G.S. and Nalbandyan A.B., Armenian Chim Zh., 1988. V.41. P.50. 36. Moreno B., Chinarro E., Pérez J.C. and Jurado J.R., Applied Catalysis B: Environmental, 2007. V.76. P.368. 37. Xanthopoulou G., Applied Catalysis A: General, 1999. V.182. P.285. 38. Dinka P. and Mukasyan A., J. Phys. Chem.B, 2005. V.109. P.21627. 39. Dinka P., Mukasyan A.S., Journal of Power Sources, 2007. V.167. P.472. 40. Lunin V.V., Grigoryan E.H., Kuznetsova N.N., Mikhal`chinets T.I., Symonyan A.V., Yukhvid V.I., Proceedings of SHS99 Symposium, Moscow, 1999; Merzhanov A.G., et al., RU Pat. No. 2050192, 1995. 41. Grigoryan E.N., International Journal of Self-Propagating High-Temperature Synthesis, 1997. V.6. P.307. 42. Agrafiotis C., Roeb M., Konstandopoulos A.G., Nalbandian L., Zaspalis V.T., Sattler C., Stobbe P., Steele A.M., Solar Energy, 2005. V.79. P.409. 43. Kumar A., Mukasyan A.S. and Wolf E.E., Applied Catalysis A: General, 2010. V.372. P.175.